Xilisoft iPhone Video Converter can convert all video files such as MOV, MP4, RM, RMVB, DivX, ASF, VOB, 3GP, WMV, MPEG, AVI to iPhone movies MP4, widescreen iPhone MP4 and convert iPhone music MP3, WAV, M4A from popular music file. Xilisoft iPhone Video Converter for Mac provides an ideal solution to convert all popular audio and video files, such as AVI, MPEG, WMV, MP4, VOB, AAC, AC3, MP3, to the formats supported by iPhone/ iPod including MP4, M4A, MP3 etc. Xilisoft PSP Video Converter can convert video files such as DVD, VCD, SVCD, MOV, RM, MPEG, 3GP, AVI to PSP video format (H.264/MPEG-4), and convert audio files including MP2, AC3, AAC, M4A, OGG, WMA to PSP MP3 with fast speed and excellent quality. Agile iPhone Video Converter is an easy-to-use video converter for iPhone video (MP4,H.264) converting.It converts video files of any format such as AVI, MPEG, MPG, WMV, Xvid, VidX, ASF, MOV, VOB, ect to iPhone compatible formats. 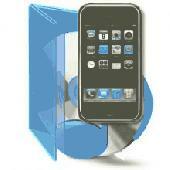 iLead iphone Video Converter is a professional conversion software for iphone only. It converts all popular video formats (wmv, rm, rmvb, avi, flv, 3gp, mp4, H264, mpg, mpeg, DivX, Xvid, dat, mkv, asf, mov, m2ts, vob ...etc) to iphone. iSkysoft iPhone Video Converter for Mac can convert videos to both video and audio files for iPhone 3G, iPod and Apple TV on Mac OS X (include MAC OS X 10.5 leopard). It can convert video to audio formats including M4A, MP3 and AAC. A-one iPhone Video Converter can convert almost all kinds of video files such as rm, divx, xvid, avi, wmv, asf, mpg, mpeg, vob, mov, qt, vcd, svcd to Apple iPhone video (mp4) format with easy. Tipard iPhone Video Converter is an easy-to-use video file converter for iPhone users. It can not only convert all videos for iPhone/iPhone 3G/3GS/iPhone 5, but also extract audio from any video and convert audio to iPhone/iPhone 3G audio formats. 4Videosoft iPhone Video Converter is the best iPhone movie converter and the great iPhone music converter, which accepts all popular video formats and convert them to iPhone MP4, H.264/MPEG-4 AVC(.mp4), MOV and MP3, AAC, WAV, M4A, AIFF. 4Easysoft iPhone Video Converter is a superior video to iPhone converter to convert video to iPhone and put movie on iPhone. It can convert video to iPhone such as MPEG/VOB/MP4/M4V/QuickTime MOV, etc and convert AVI to MP3/AAC/M4A for iPhone. Angel iPhone Video Converter is the choice for iPhone video and audio conversion program. It supports most of video formats including H264(MPEG-4 AVC),AVI,MP4,MOV and audio file formats like MP3,AAC,M4A and more. Aiseesoft iPhone Video Converter for Mac is a professional Mac iPhone Converter to convert all popular video/audio files to iPhone H.264/MPEG-4 AVC, H.264, M4V MPEG-4, MOV, MPEG-4, WMV, H.264 HD video and AAC, AIFF, M4A, MP3, WAV, WMA audio formats. Aneesoft iPhone Video Converter for Mac is the easiest and fastest way to convert video files including HD to iPhone MP4 video format and MP3, M4A audio formats on Mac OS. Convert and enjoy video entertainment on iPhone, iPhone 3G and iPhone 3G S.
Xlinksoft iPhone video converter can convert all popular videos AVI, MPEG, WMV, MOV, MP4, VOB, XviD, WMA, ASF, 3GP to iPhone supported video or audio formats MP4, MP3, etc. You can customize the output size, and video quality.